Is that article referring to this Corey Goode? Technology is always political. Basically, technology can be used -- especially paradigm shifting technologies -- to reduce the power, influence, and control of government. For example, when high powered Ni-H technology starts to spread across the globe in a major way, there will be many very concerned politicians and members of the wealthy ruling class. Imagine how compact, portable, long lasting, and power dense LENR generators could give more options to everyone! Groups of like minded individuals could more easily start their own independent communities, travel would become far less expensive with the energy cost taken out of the equation, decentralized power would make it more difficult for corrupt governments to order cities blacked out, colonizing the solar system could finally become practical, and the list goes on! Moreover, such an energy technology would totally negate any currently existing false illusions about the need for carbon taxes or related environmental regulations -- making George Soros and hundreds more of his elite ilk very unhappy! Very insightful TDIU. Government control is the main force behind it all. First we had the "Cold War", from which the Government protected us, and by which they controlled us. Was it a coincidence that not long before it ended the (false?) narrative of thinning ozone layer and then catastrophic global warming began to be pushed on us, simply another huge threat that the government could pretend to protect us from, and of course control us by. What has happened to folks in the past, who buck this strategy (like Rossi) is also very revealing. Back in the late 1970's in LA, when the totally fake, and contrived, Arab oil shortage was doubling the price of gasoline, a scientist/inventor named Gerald Shafflander came up with a way to cheaply produce liquid hydrogen fuel, which could be directly substituted in ordinary Gasoline combustion engines. The liquid hydrogen fuel he invented was proprietary, but the biggest innovation was how to produce it cheaply using solar power and salt water. At the time it would have halved the price of $1 per gallon gasoline, and, just as importantly, eliminated virtually all emissions. He was on the verge of huge success, when a large Oil Company (Texaco I believe) made an offer to purchase the invention for millions. He was not in it for the money and rejected the offer. Within a few weeks, his contract to convert Post Office Jeeps was cancelled and, soon after, another big contract (Simplot Ag. Corporation) was also cancelled. Within another week or so the facility was raided by government agents and all proprietary information and technology were confiscated. Shafflander and his CFO were arrested after the raid and charged with SEC violations, which were almost certainly bogus. Shafflander brought civil action, but it was dropped after a plea negotiation, and I believe both were sentenced to 5 years in prison. This is contrary to what you will read on the internet, where he is mostly branded as a "scam artist" (sound familiar?). Why do I believe otherwise? For the year preceding and up to the arrest, my wife was a close personal assistant to Dr. Shafflander, with access to much information that never reached the public ear. With a good idea what was really happening we were afraid that she might be drawn into the net, but to our great relief she was not charged, or even called to testify. I've recently published a book (Science Fiction/Time Travel) in which my protagonist travels back in time to rectify the injustice https://www.amazon.com/JOY-RID…sr=1-1&keywords=Mike+Rion. Anyway, with the internet and difficulty of controlling information this probably couldn't happen today. Or maybe it could. LENR is a potentially much more disruptive technology than Dr. Shafflander's fuel. Ever heard of a technocracy? Corrupt governments blacking out cities? My word! Is this some kind of parody? "The elite" don't own the power companies, we all do: pension companies love the steady returns. And how on earth does heating my house with a small LENR reactor somehow confer autonomous zone status on my property - allowing me and my fellow community of anarchists to run wild in our own weapons-crazed drug-fuelled libertarian fun parade? I have never heard such naivete. Research team warns of mineral supply constraints as demand increases for green technologies. Renewable energy needs copper, steel, aluminium and concrete, which simply have no cheaper replacement. According to this study, if the contribution from wind turbines and solar energy to global energy production is to rise from the current 400 TWh to 12,000 TWh in 2035 and 25,000 TWh in 2050 (as projected by the World Wide Fund for Nature), about 3,200 million tonnes of steel, 310 million tonnes of aluminium and 40 million tonnes of copper will be required to build the latest generations of wind and solar facilities. This corresponds to a 5 to 18% annual increase in the global production of these metals for the next 40 years. And 25,000 TWh is still just one sixth of the total world energy consumption. 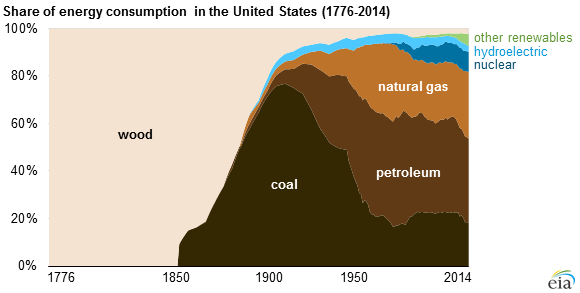 The fossil fuels have made up at least 83% of U.S. fuel mix since 1900. The 83% of electricity consumed by your electromobile still comes from fossil sources and the car is still twice-time as expensive as the gasoline car. The general criterion of savings is the cost. If you have electromobile twice moe expensive than the classical car during its life time, then you're still two-times more demanding your carbon footprint and life environment. The world numbers are even worse than that. Because the application of renewables increases the net demand for fossil energy on background, its share didn't actually decrease during last 25 years. But one half of tropical forests disappeared during this period just in the name of the biofuels: we actually burned these forests for fuel. No, the forests were cleared and burned so that uncontrolled population growth could have more arable land to grow food on. The post was edited 1 time, last by Rionrlty ( Mar 23rd 2017 ). How so? Why is it naive/wrong? I didn't say it was wrong, only naive. First, look at my reply to "THEDEBATEISUSELESS" in post #184 above, as an excellent example of why its naive. Do you really think that the oil, gas and electric utility companies and all the other connected financial interests in the status quo are going to stand by idly while we replace their livelihoods with something they cannot control. There is a reason why they call it a "disruptive" technology. None of us have any idea of how far these special interests will go to protect their current fiefdoms, when push comes to shove. Nor do we know how far the US, and other world governments will go to help protect and preserve them. Remember the phrase "Too big to fail" regarding the 2008 financial crisis? Well, these utilities are even bigger than that and can neither be allowed to fail. My best guess, and I used this idea in my book, is that the current utilities will be allowed to control and administer the new technology and charge a fee for its use. This right will be awarded to them by the government, in the name of public safety most likely (they're protecting us once more), but in the end it will really be so that the energy markets and investors will be protected from the economic disruption and huge losses that would result. So, for our own good we will be allowed to purchase, at our own expense, automobiles, home heating and air conditioning systems, home or business sized power generating systems etc. minus the LENR power supply, which will be leased to us, as a modular unit, from the current purveyors of various energies. The cost of this will be calculated by an estimate of the current replacement cost of contemporary supplies of energy. In other words if a persons heating and cooling bill is currently $350 month, then the cost of the LENR power supply for same will be $350 month, or if a persons current total utility costs are $500 month then that will be the monthly fee for the LENR power supply to furnish the same amount of energy. Cars will come equipped with the mobile equivalent of "smart meters" to supply mileage information directly to the power company. The owner will then be charged accordingly, again a comparable amount to the cost of conventional fuels. As a justification for this type of system, they will say that no simple individual owner could possibly be trusted with the proper maintenance, refueling or upkeep of such a dangerous and complex item as an LENR power supply. In the end there will be no cost savings to us, nor any additional level of autonomy, but I guess if you believe in Global warming or atmospheric polution that might be an added advantage. I don't. The post was edited 2 times, last by Rionrlty ( Mar 23rd 2017 ). I think that the pioneering interest shown by IH in LENR research is indicative of the fact that the control and monetisation of any disruptive technology (disruptive in terms of impinging upon the established pattern of cash-flow) will be swift, aggressive, and comprehensive. I can see why they would think so, but again, it requires a certain amount of naivete to believe it won't be controlled centrally to a large degree. In light of my prediction above, whoever develops it will be in for a big payment. Look how much the banks were paid to not fail. I can see why they would think so, but again, it requires a certain amount of naivete to believe it won't be controlled centrally to a large degree. but I guess if you believe in Global warming or atmospheric polution that might be an added advantage. I don't. Let me guess - you also consider the scientists studying climate change as being 'naive', and that those who base their scientific opinions on Fox News reportage are paragons of rationality and critical thinking? The post was edited 1 time, last by Zeus46 ( Mar 23rd 2017 ). PhysicsWorld staff (James Dacey) apparently doesn't handle discussions well... - all posts were deleted and article locked for discussion. Edit: few hours after I linked it here even the team page of PhysicsWorld staff disappeared from the web too - it existed there for ten years! The post was edited 1 time, last by Zephir_AWT ( Mar 23rd 2017 ). No they are certainly not naive. Some are careless with their conclusions, some are greedy for the grant money that the subject allows so copiously, some are "snowflake" liberals who just want to believe and some are simply hanger's on who want to ride the politically correct next wave. You complain about Rossi's qualifications and honesty, but the proofs and theories of so-called climate change scientists are far less credible than he is. And that's Hypocrisy. As far as Fox News I think you just made a lucky guess LOL. In 1900 U.S. railroads, especially the Pennsylvania Railroad were the largest, wealthiest and most politically powerful corporations on earth. They held sway in the Congress. They crushed attempts by labor to organize. In 1908, Henry Ford began manufacturing the Model T. By the 1920s, railroads were losing business to automobiles and trucks. In the 1940s they were losing business to airlines, and their political power was gone. The Pennsylvania Railroad was gone by 1970. North Atlantic ocean liners suffered a similar fate, much more quickly, with post-WWII air transportation on their routes. In the 1960s and 70s, IBM dominated the computer business. At one point I think it was larger than its 7 rivals combined (the "seven dwarfs"). In the early 1980s it introduced the PC and took over the microcomputer business. It reached a zenith in the mid 1980s and then the market changed, IBM stumbled, it lost record amounts of money, and it nearly went bankrupt. AT&T dominated the telephone business until the technology and regulations change. It went bankrupt. The present company kept only the name. General Motors dominated the automobile business worldwide. It went bankrupt in 2009, losing all stockholder value. U.S. Steel and many other companies that dominated their industry went bankrupt. Kodak is effectively bankrupt, along with most other "dream stocks" of the 1960s. Sears is on the verge of bankruptcy, because of competition from Amazon.com. Corporations are much less powerful than people realize. Yes, individual companies fail often, mostly because they fail to keep up with the times and the new paradigm, but the transportation, auto, steel and, yes, the retail business is healthy in general, as is telecommunications. But we're not talking about an individual company here. We are talking about all of energy production and sales, throughout the world. That is a bit different. To extract oil, water and gas must be banned! This is the blood of the planet and its production leads to global climate change. It is urgent for the whole world to seek new energy!